ICAN has started the count-down to 5 May 2019, the global annual hand hygiene campaign day! We hope that you all will take part to promote hand hygiene within your facilities. Remember, the campaign is one important part of influencing the behaviour of each and every health worker to achieve improved, sustained hand hygiene action and patient and health worker safety. Hand hygiene is at the core of effective infection prevention and control (IPC) practices, which every health care facility should be aiming for. 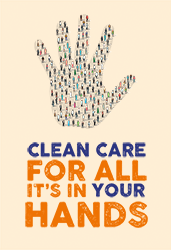 Each year the WHO SAVE LIVES: Clean Your Hands campaign aims to maintain a global profile on the importance of hand hygiene in health care and to ‘bring people together’ in support of hand hygiene improvement globally. We are asking our members to keep us up to date with their planned activities by submitting photos and information on local events by emailing admin@icanetwork.co.za for inclusion on our website and social media. Over this next few weeks keep a check on our website and social media for more information. Lets work together to Turn Africa Orange!!! !